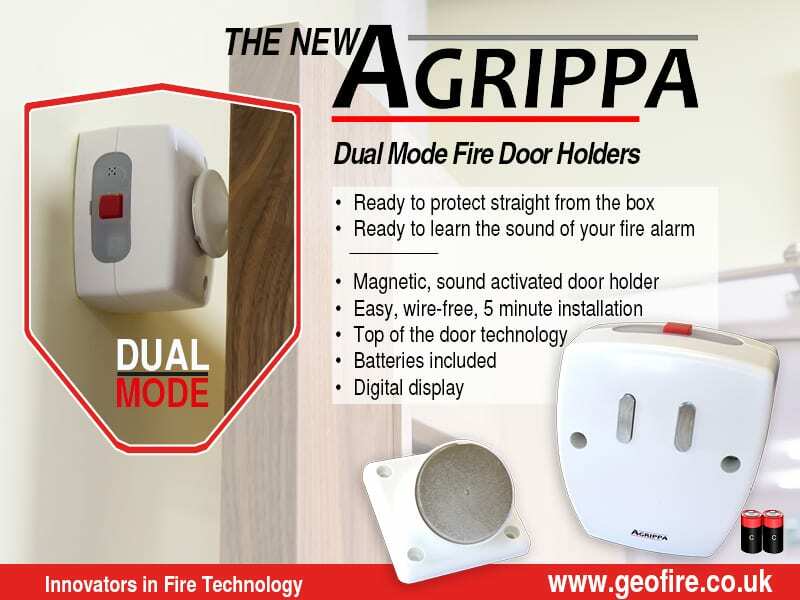 Geofire is delighted to announce the launch of its enhanced Agrippa range, which includes a ready to protect mode straight from the box, as well as its signature listen and learn technology. de, providing customers with the choice to complete the programming of its innovative ‘listen and learn’ technology. All the Agrippa devices are now programmed during the manufacturing process to protect as soon as they are installed correctly onto a fire door. Our in-house engineers have tested the devices to ensure they disregard most loud sounds except fire alarms, including appliances such as vacuum cleaners and other loud noises that are common in offices, hospitals, schools and other public and multi -occupancy buildings. Nick Goddard, the engineer who developed the dual mode Agrippa, states: “Our listen and learn technology was the first and is the best on the market for listening to the specific sound of your fire alarm. We recommend that you teach your device to learn the sound of your fire alarm for better protection. All our Agrippa devices will now be ready to protect your people and buildings with additional peace of mind and reliability. Sounding the alarm to carry out this process is a small price to pay compared to the potential consequences. The Agrippa electro-magnetic fire door holder is a wire-free device used to legally hold open internal fire doors. The compact device is fitted to the wall behind the door and a keeper plate is fitted to the top of the door (it can also be floor mounted). Using a magnet, the wire-free devices hold the door open, providing easy access through a building. In the event of the fire alarm sounding, the magnet is released, and the door is automatically closed to prevent the spread of smoke and flames, should a fire occur. The easy to install holders have a range of other key features which make it ideal for most fire doors, the LED display screen makes it easy to maintain and check battery level. There is a daily timed release option which means that the doors can be closed once a day at any time it is programmed. The Agrippa fire door closer learns the sound of your specific fire alarm, releasing the door in the event of a fire. 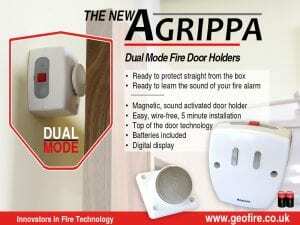 Like the Agrippa fire door holder, it is now dual mode which enhances the convenience of the product. Agrippa is innovative within the industry due to its wire-free listen and learn technology which can be easily be retrofitted to any door. The closer is easy to install, only requires C cell batteries (which last for 12 months) and can be programmed for daily release and has adjustable closing speeds. It is now ready to protect straight from the box, allowing the learning technology to be performed at a more convenient time, allowing the Agrippa to protect your buildings and people within 5 minutes. The holder and closers are both recognised by UK Fire and Rescue Services and the London Fire Brigade, suitable for installation to BS 7273-4 Standard Actuation (Category B) and conforms to EN1155 and is CE marked.